We are garden fairies and we are shaking our heads and checking our calendars because the weather sure feels like summer but we are pretty sure it is fall. After all, the zinnias are fading and our friends the monarch butterflies are loading up for their big trip to Mexico. We wish them bon voyage and safe passage and look forward, as always, to their return next year. Here at May Dreams Gardens, we garden fairies have been busy preparing for fall weather whenever it arrives. 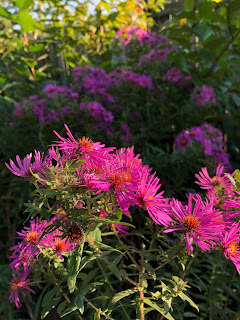 Seedy and Soddy finally got the asters to bloom. Whew. 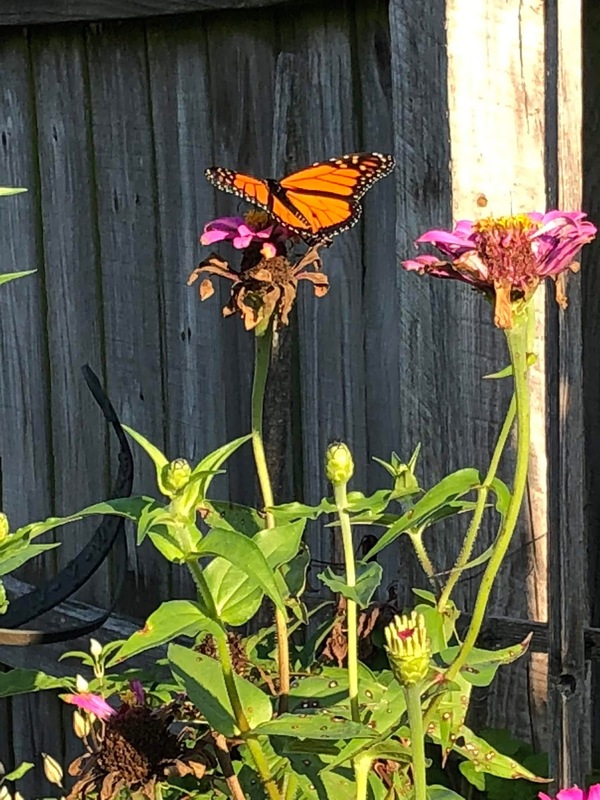 Carol came out and checked them on Michaelmas, September 29th, when they are supposed to be in full bloom, and just shook her head at the pathetic showing on what is supposed to be their peak day of bloom. Just buds! Well, Granny Gus McGarden found out that Seedy and Soddy were behind in opening the asters so she threatened them with no more tomatoes until the asters were in full bloom. Everyone knows that Seedy and Soddy live to eat tomatoes, so they got going and now the asters are in full bloom. 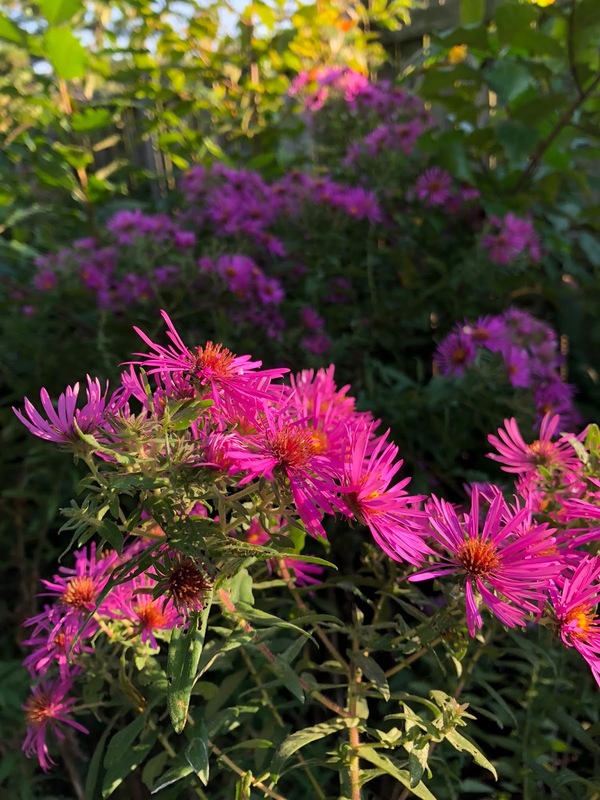 We do need to report that there are not as many asters in the garden as in past years because Carol got a burr in her saddle and ripped out a bunch of asters that were growing in Plopper's Field. She did not gently dig them up and transplant them elsewhere. She did not even check around to see if anyone else wanted them. No, she ripped them out and composted them! But even though there aren't as many asters, the bees and butterflies are still finding them. So in conclusion regarding asters, we are garden fairies and we approve the removal of the asters earlier this year. We do not approve of the violent way Carol ripped them out. We also do not approve of the summer-like weather and look forward to the arrival of fall, finally, hopefully, expectedly, later this week. And once fall does arrive, finally, hopefully, expectedly, later this week, we expect Carol to be out here in the garden helping to prepare it for winter by weeding, cutting back, cleaning up, and otherwise doing stuff that we garden fairies do not do. Not because we are lazy, which is a known fact, but because we'll be busy changing leaf colors, opening up the fall crocuses, and doing our best to keep Jack Frost from arriving too soon. P.S. We garden fairies have been hearing that readers enjoy our posts. We think we are now more popular than Carol. In fact, we are sure of it! Love this. This weather has been enjoyable, but kind of crazy. I planted 'heavenly blue" morning glories. They did not bloom all summer. There are buds and one blooming flower on the plant. I also have a Canna that showed up in July.I did not plant It is in full shade, and is blooming. You are right, your garden fairy posts are delightful!